Termites cause more damage to Australian houses than fire, floods and storms combined damage that is not covered by household insurance. This shows just how important effective and thorough termite management is. At Eco Pest Solutions, we can provide you with thorough termite inspections, reports, termite control and management solutions. Or have you founds signs of a termite infestation at your property? We can help. More than 350 species of termites have been recorded in Australia, about 30 of which achieve economic importance as pest of timer-in-service. King and Queen: the main function of the king and queen are reproduction. Only the king and queen have eyes. The rest of the termites are blind and navigate using scent and moisture trails. Winged Reproductives (alates) are the sexual form of a colony: the future kings and queens of colonies yet to be established. Soldiers defend the colony from invaders, typically ants and termites from other colonies. Workers are a milky or creamy colour. As their name suggest, they do most of the work in the colony. They dig tunnels, gather food and care for the young. They also feed the king, queen and soldiers, who are unable to feed themselves. Workers and soldiers are sterile. Call us on (02) 8399 0899 for a consultation or to book a Termite Inspection now. Termites are wood-destroying insects. Their presence dates back to the dinosaurs. 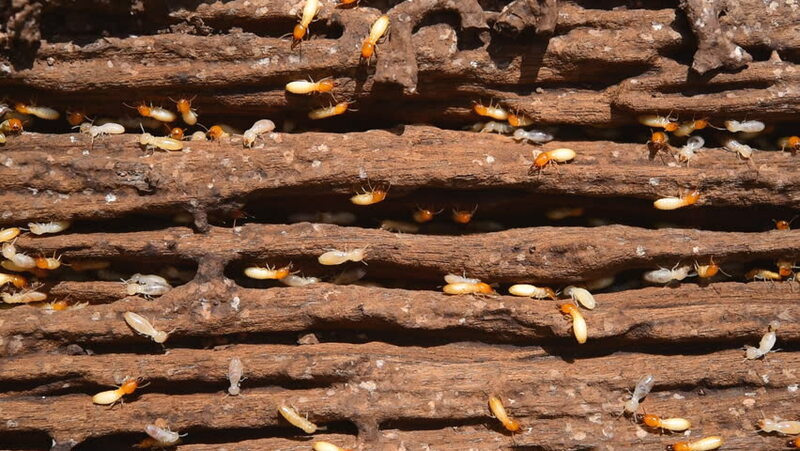 While they play a beneficial role in nature by breaking down dead wood and returning nutrients to the soil, experts estimate they cause over $700 million of property damage in Australia each year, so termite management is very important to any property owner. Termites are similar in size to ordinary black ants. They are pale, some with darkened heads (soldiers). You are more likely though, to see their mud tracks or timber damage first. Termites like to stay hidden inside timber or their mud leads. No. Termites are actually more closely related to cockroaches than ants even though some termites look a very much like “white ants”. Australians commonly call termites “white ants” but they actually are termites, not ants. Is there a way to distinguish between ants and termites? One of the obvious differences between ants and termites is that ants have three body sections and while very similar termites only have two sections. Termites have relatively straight, bead-like antennae while ants have elbowed antennae. Flying ants have wings that are the same size as their bodies but the wings of a termite are longer than the actual size of the body. If I find termites what should I do? Avoid disturbing termites before a thorough inspection can be carried out. Disturbing termites may make it difficult to assess the extent of the infestation and may prevent identification of the termite species. It can also reduce the number of treatment options available. A termite inspection involves a thorough visual inspection of the sub floor, roof void, interior, exterior and other areas of the property. An average house takes anywhere from two to three hours to complete. Cost may vary from $180 – $300 depending on the size of the house and access. A thorough and detailed written report is then provided. 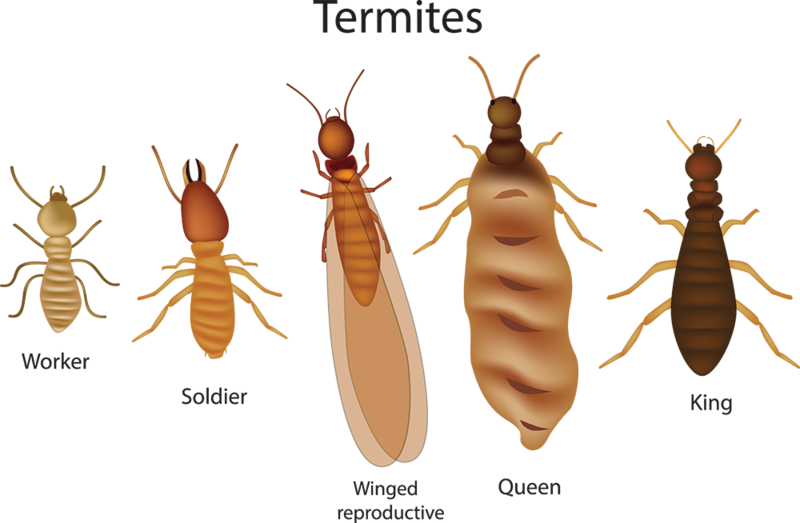 There are several methods available to treat termites. The most common treatments are: Chemical barrier, baiting systems and dusting. The most effective type of treatment depends upon the severity of the infestation, the species of termite and the location and construction of the home or building. At Eco Solutions Pest Control we asses each infestation separately and recommend a rigorous treatment plan that will effectively control the termite population. Avoid landscaping with bark chips and irrigation systems against the house. Termites are attracted to wood, so remove potential termite food away from buildings – their food can include timber stacks, old stumps, cardboard, paper products, garden decoration such as sleepers and logs. Any time there is direct wood to soil contact it creates an ideal condition for termite infestation. Remove sources of moisture e.g. water heater overflows and air conditioners which are not directed to a drain, leaking and dripping taps, faulty plumbing and tiling in showers, baths and kitchens. Check all gutters and downpipes and make sure that the water ends up well away from the house. Ideally downpipes should connect to drains. IF you don’t have any of these, at least redirect the water well away from the house. Downpipes which regularly splash near the structure maybe supplying an irresistible source of moisture. Do not place plants to close to structures. When plants are growing close to buildings they provide food and moisture for termites. It also makes it difficult to see any signs of damage. Waste timber from construction activities is often left in place or stored under the house – remove all timber off cuts and formwork.